Kevin Sloan merges classicism with ecological sensitivities and a sense of modernism. Kevin Sloan’s much recognized work as a landscape architect and planner includes private and public projects of all sizes, in locations as diverse as Dallas and New Delhi. His work ranges from a serenely modern square pool in a Dallas garden, to the lush, 212-acre Sprint headquarters campus in Kansas City. 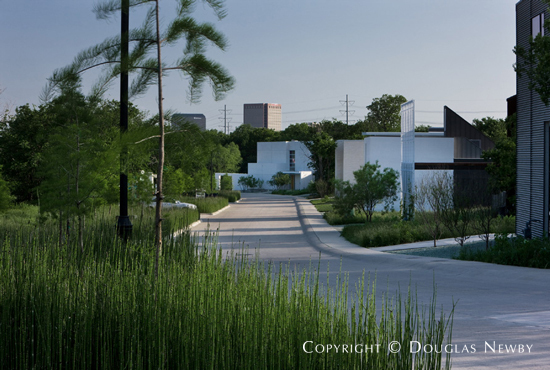 Kevin Sloan’s landscape design for the architect designed modern residential development Urban Reserve was named one of the most innovative green projects for 2009 by an environmental journal, Eco-Structure. Now nearing completion, his imaginative work on an estate home on a Fort Worth bluff features a grotto, a fountain and a pergola.